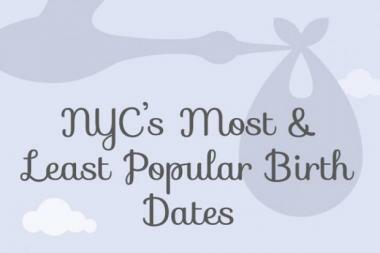 DNAinfo New York found more babies were born on Sept. 20 than any other day. MANHATTAN — Blow out the candles, New York! Kids born in New York City on Sept. 20 have the No. 1 birthday of the year, according to an analysis by DNAinfo of birth data from 2004 to 2011, obtained from the city's Health Department. NYC deliveries have a seasonal ebb and flow — with more births in summer months — and many moms appear to avoid giving birth on holidays, three-day weekends and emotionally loaded anniversaries such as Sept. 11, DNAinfo found. While women don't have total control over their due dates, roughly 34 percent of births across the state are delivered via C-section and an estimated 12 to 17 percent of labors are induced, according to the state health department. Obstetricians say the combination of elective cesarean sections, inductions and the aversion to rush into labor on certain days are reflected in unexpected patterns of births that offer a peek into the minds of expectant moms in the area. Christmas is the least popular day to give birth, with an average of 252 births, followed by New Year's Day and July Fourth, according to the analysis. Days immediately after these holidays, on or around Thanksgiving and on the three-day weekends like Memorial Day, Labor Day and Columbus Day are also among the least popular days to give birth. "People try to avoid giving birth on holidays," Dr. Ashley Roman, medical director of NYU Langone's Maternal Fetal Care Center, said. "Part of it is you want your baby to have a birthday where the celebration is all about your baby." 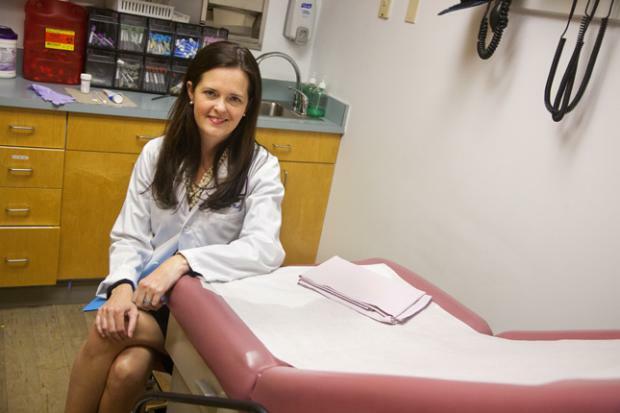 Dr. Roman understands the desire to have a certain birth date — or avoid a particular day. When she was pregnant with her daughter seven years ago, she was nearly a week past her due date and approaching June 6, 2006. So, to avoid having a "666 baby," she scheduled a C-section for the day before. "I’m not a superstitious person or religious person, but my brain was gone and my hormones took over," Roman said. "I was horrified my little girl would be labeled a 'demon child' for the rest of her life." Dr. Jacques Moritz, director of the gynecology division at St. Luke’s-Roosevelt Hospital Center, said patients' major concern about holidays was "whether you are going to be on call." He said that patients sometimes ask to be induced before he goes away for Christmas. "They ask if the 'B team' is going to be on," he explained, adding, "We have no B team." While it may have once been common to schedule births around doctors' or patients' vacations, the state's Health Department recently began cracking down on elective births before 39 weeks when not medically necessarily, and reducing Medicaid payments to those who choose them, starting in July. The Health Department explained its policy was motivated by concerns over possible complications for infants and increased risk of infection to mothers. The data also seems to back up doctors' experience that Sept. 11 is a day that many moms avoid because of the day's negative associations with the World Trade Center attacks. Moritz said he recently asked a patient of his who was 39 weeks pregnant with gestational diabetes — which carries certain risks — to come in for an induction on Sept. 10, which could have meant she would give birth on Sept. 11. "She would not come in," Moritz recounted. She went into labor on Sept. 12. He said he often tweaks the due date to keep from upsetting his patients. "If a patient's due date is 9/11, I’ll tell them it's 9/12 or 9/10," Moritz admitted. The data show the average number of births on Sept. 10 and Sept. 12 are significantly higher than those on Sept. 11, suggesting that patients due that week may actively try to avoid that day. When Sept. 11 fell on a weekday, there were 29 fewer births than on Sept. 12 and 34 fewer births than on Sept. 10 on average, the analysis found. Moritz said the trend began the day of the 9/11/01 attacks, when he and his colleagues at St. Luke's-Roosevelt were prepared to deliver hundreds of babies. None of the women came in to give birth, he said. "I believe we delivered zero patients, and we deliver 7,000 a year," Moritz said, explaining that the body can release stress hormones when it doesn't think it's a safe time to deliver. "Stress hormones that are released that can reduce chance of labor," he said. There are many old wives' tales about lucky and unlucky days for giving birth, and the analysis revealed that some New York City women subscribe to these beliefs. Halloween is the No. 10 least popular day to give birth, and many doctors also said that that some women try skip the 13th of the month so their kids won't have a Friday the 13th birthday. Certain days of the week were more common. For example, the average number of births on weekend days (256) was much lower than weekdays (339). Numerology also seemed to play a role, as two of the top 10 most popular days fell on the eighth day of the month, which is considered a lucky number in some Asian cultures. Financial issues also may have had a big influence on birth days, the data showed. There were 47 more births on average on Dec. 31 than on Jan. 1, suggesting some families may have sought to cash in on tax breaks — which can be claimed for the whole calendar year, regardless of when the child was born. Maternity wards at New York City hospitals are hopping every Sept. 20, with an average of 377 births on weekdays. Labor and delivery floors are busier in September overall, with an average of 352 daily births during the week. August, July and June come in close behind, the analysis showed. Asked to explain why September was the biggest birth month, obstetricians said it's all about the canoodling in the wintertime. "A cold storm means Dr. Moritz will be busy in August and September," he said of his OB practice.